I'm making a vest for Luke. This yarn has quite the history. 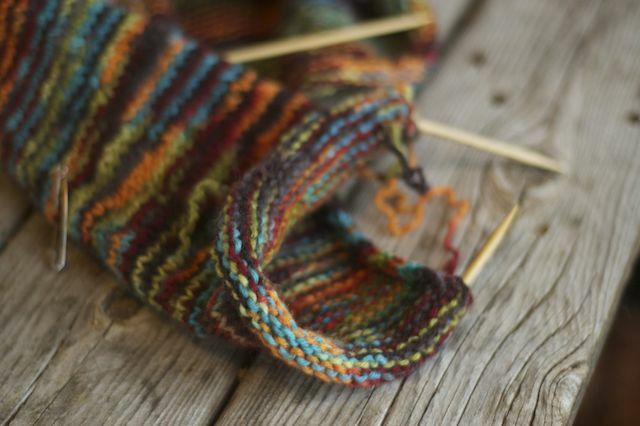 It was some that I dyed years ago for a garter stitch sweater I designed for Luke. A one piece kimono style sweater that turned out to be far too much garter stitch with too much bulk and weight. Anyway, I digress. The yarn. I dyed what I thought would be enough, not knowing at the time how much extra yarn you need for garter stitch and alternating skeins to avoid pooling. I ran out. So I dyed another skein, painstakingly matching colors as best I could. Pure agony, I tell you. I ran out again. One more skein dyed. Long story short, the sweater was done and worn and loved and put into the box of woolens when it was outgrown. Luke recently found it when we were going through things for the winter. He desperately wanted to wear the sweater, but it was about four inches too short in every direction and he didn't seem to care. I finally convinced him to take it off when I suggested we frog the sweater and make something new with the yarn. A vest. I'm using the pattern Basic Vest for Children which I found at the thrift store last week. So far so good. I think it will be finished tomorrow and with maybe enough yarn left over for a pair of mittens. What's on your needles right now? Any holiday knitting? I'm joining Ginny for Yarn Along this week, too.